Pirlo began his club career as an attacking midfielder with his hometown club Brescia, whom he helped win a Serie B title and subsequent promotion to Serie A in 1997. His promising performances led to a move to Inter Milan in 1998, but he struggled to gain playing time at his new club, and was sent on loan in 1999. Despite successful spells with Reggina and a return to Brescia, Pirlo was still unable to break into Inter's starting line-up and was sold to cross-city rivals A.C. Milan in 2001. At Milan, manager Carlo Ancelotti decided to transition Pirlo into a deep-lying playmaker to orchestrate the team's attacks. Pirlo excelled in his new role and soon developed into a world-class midfielder, and won a plethora of trophies, including two UEFA Champions Leagues, two UEFA Super Cups, two Serie A titles, a FIFA Club World Cup, a Supercoppa Italiana, and a Coppa Italia. After joining Juventus on a free transfer in 2011, who had gone trophyless since 2003, he added four more Serie A titles, which he won consecutively, as well as two Supercoppa Italiana titles, and a Coppa Italia. 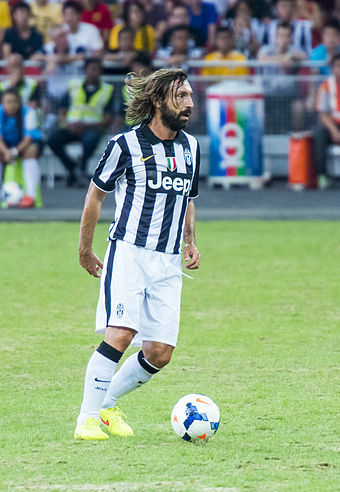 After playing in Italy for over 20 seasons, Pirlo joined Major League Soccer franchise New York City in 2015, helping the team to reach the playoffs in his second and third seasons before retiring in 2017. Brescia Calcio, commonly referred to as Brescia, is an Italian football club based in Brescia, Lombardy, that currently plays in Serie B.
Serie B, currently named Serie BKT for sponsorship reasons, is the second-highest division in the Italian football league system after the Serie A. It is currently contested by 19 teams, however usually consists of 22 teams, and is organized by the Lega Serie B since July 2010, after the split of Lega Calcio that previously took care of both the Serie A and Serie B. Common nicknames for the league are campionato cadetto and cadetteria, as cadetto is the Italian for junior or cadet. The Italy national U-15 football team is the national under-15 football team of Italy and is controlled by the Italian Football Federation. 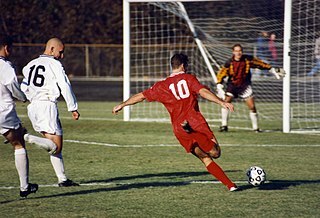 The Italian national under-18 football team represents Italy in international football at an under-18 age level and is controlled by the Italian Football Federation, the governing body for football in Italy. The team was known as Italy national under-17 football team prior 2001. The Italy national under-21 football team is the national under-21 football team of Italy and is controlled by the Italian Football Federation. Brazilian midfielder Kaká won the 2007 FIFA World Player of the Year award, while another Brazilian, Marta, took home the women's award. The winners were announced at the FIFA World Player Gala held at the Zurich Opera House on December 17, 2007. The 2007 Ballon d'Or, given to the best football player in the world as judged by an international panel of sports journalists, was awarded to Kaká. This was the first year in which players from clubs outside the UEFA federation were eligible for nomination; this change also led to an increase in the voting pool to include journalists from outside UEFA countries. Flero is a comune in the province of Brescia, in Lombardy. The 1994–95 Serie A was won by Juventus, who finished 10 points ahead of their nearest rivals Parma and Lazio. The 1998–99 Serie A saw AC Milan win their 16th Scudetto, led by coach Alberto Zaccheroni. Lazio finished second, losing the title on the last day. Internazionale, with an often injured or rested Ronaldo, had a disastrous season, finishing in 8th position, whereas Juventus' impressive start was cut short by a bad injury to Alessandro Del Piero, and they wound up having an unimpressive season. The 1999–2000 season of Serie A, the major Italian professional football league, was contested by 18 teams. Roberto Baronio is a retired Italian football midfielder who currently works as a manager, in charge of the Under-19 team of Napoli. "I don't feel pressure ... I don't give a toss about it. I spent the afternoon of Sunday, 9 July 2006 in Berlin sleeping and playing the PlayStation. In the evening, I went out and won the World Cup." Roberto Baggio is an Italian former professional footballer who mainly played as a second striker, or as an attacking midfielder, although he was capable of playing in several offensive positions. He is the former president of the technical sector of the Italian Football Federation (FIGC). A technically gifted, creative playmaker and a set piece specialist, renowned for his curling free-kicks, dribbling skills, and goalscoring, Baggio is regarded as one of the greatest players of all time. In 1999, he came fourth in the FIFA Player of the Century internet poll, and was chosen on the FIFA World Cup Dream Team in 2002. In 1993, he was named FIFA World Player of the Year and won the Ballon d'Or. In 2004, he was named by Pelé in the FIFA 100, a list of the world's greatest living players. Gennaro Ivan "Rino" Gattuso is a retired Italian footballer and current coach of Milan. Filippo "Pippo" Inzaghi is a retired Italian professional footballer and current manager, who most recently served as head coach of Serie A team Bologna. Carlo AncelottiOSI is an Italian former professional footballer and current football manager of Napoli. Leonardo Bonucci is an Italian professional footballer who plays as a centre-back for Serie A club Juventus and the Italy national team. Antonio Conte is an Italian professional football manager and former player. Claudio Marchisio is an Italian professional footballer who plays as a midfielder for Russian club Zenit Saint Petersburg and the Italian national team. A product of the Juventus youth system, he spent a large portion of his career at his hometown club, with the exception of a season-long loan spell at Empoli, winning seven consecutive Serie A titles between 2012 and 2018, and four consecutive Coppa Italia titles between 2015 and 2018. He was the club's second vice-captain, behind Giorgio Chiellini, before his contract was terminated in 2018 and subsequently signed with Russian club Zenit Saint Petersburg. This page details football records in Italy. Andrea Poli is an Italian footballer who plays as a midfielder for Serie A club Bologna F.C. Massimiliano Allegri is an Italian professional football manager and former player currently in charge of Serie A club Juventus. Marco Verratti is an Italian professional footballer who plays as a central midfielder for Ligue 1 club Paris Saint-Germain and the Italy national team. Paulo Bruno Exequiel Dybala is an Argentine professional footballer who plays as a forward for Italian club Juventus and the Argentina national team. Considered Europe's top five leagues' sixth most expensive player from a transfer value perspective by the CIES, he is commonly referred to as "La Joya" due to his creative style of play, pace, talent, technique and eye for goal. Manuel Locatelli is an Italian footballer who plays as a midfielder for Sassuolo, on loan from Milan. ↑ "FIFA World Cup South Africa 2010: List of Players: Italy" (PDF). FIFA. 4 June 2010. p. 15. Retrieved 21 January 2019. 1 2 3 4 5 6 "A. Pirlo: Summary". Soccerway. Perform Group. Retrieved 21 January 2019. 1 2 3 4 5 6 7 8 9 10 "FIFA Confederations Cup Brazil 2013 Player Profile: Andrea Pirlo". FIFA. Archived from the original on 12 July 2015. Retrieved 8 May 2015. 1 2 "Pirlo Sig. Andrea: Cavaliere Ordine al Merito della Repubblica Italiana" . Retrieved 6 August 2014. 1 2 "Pirlo Sig. Andrea: Ufficiale Ordine al Merito della Repubblica Italiana" . Retrieved 6 August 2014. 1 2 "Born Again: How the Deep-Lying Midfielder Position is Reviving Careers". Soccerlens. 31 July 2009. Retrieved 15 May 2012. 1 2 3 4 5 6 "Andrea Pirlo: Player Profile". ESPN FC. Retrieved 4 September 2013. 1 2 3 4 5 6 7 8 9 10 11 12 13 "A.C. Milan Hall of Fame: Andrea Pirlo". A.C. Milan. Retrieved 31 March 2015. ↑ Ingo Faulhaber. "IFFHS". International Federation of Football History & Statistics. Retrieved 15 May 2012. 1 2 "Iniesta, Messi, Ronaldo up for Best Player Award". UEFA. 14 August 2012. Retrieved 19 August 2012. 1 2 3 "Best Player in Europe: Messi, Ronaldo or Suárez". UEFA. 12 August 2015. Retrieved 12 August 2015. 1 2 3 4 "FIFPro World XI 2006". FIFPro. Retrieved 24 August 2012. 1 2 "Serie A Team of the Year" . Retrieved 30 January 2013. ↑ "Classifica 100 migliori calciatori del 2012 stilata dal The Guardian" (in Italian). Retrieved 23 December 2014. ↑ "Messi and Ronaldo joined by Ribery in top three of new list of Europe's top 50 stars". Sky Sports. 12 June 2013. Retrieved 14 June 2013. ↑ Thomas Simon (19 May 2015). "Le top 10 des meilleurs vieux" [The top 10 of the best oldies]. France Football (in French). Retrieved 4 August 2015. ↑ "Genio d'artista e cuore da mediano Pirlo: "Sono nato per avere la palla"". La Stampa (in Italian). 24 December 2012. Retrieved 3 February 2015. ↑ Passerini, Carlos (26 June 2012). "Pirlo e il cucchiaino d'oro: "Lo faceva già da ragazzino"". Corriere della Sera. Retrieved 3 February 2015. ↑ Vincenzo Corbetta. "E ora vincerò con la Juve, ma ho il Brescia nel cuore". Bresciaoggi (in Italian). Retrieved 3 February 2015. ↑ Corrado Zunino (6 August 1998). "Pirlo, ecco la star dell' estate". la Repubblica (in Italian). Retrieved 3 February 2015. 1 2 Sergio Zanca. "Pirlo, il genio dei record Ora è 400 volte grande". Bresciaoggi. Retrieved 3 February 2015. ↑ "ESCLUSIVA TJ – Marco Schenardi: "Lucescu? Un innovatore, tanto da farci una tesi a Coverciano. Ho visto crescere Pirlo, incredibile pensarlo leader"". TUTTOmercatoWEB.com (in Italian). Retrieved 3 February 2015. ↑ "Memories of 16-year-old star Pirlo". Football Italia. Tiro Media. 26 June 2012. Retrieved 20 September 2012. ↑ "Pirlo al Brescia trova Baggio". Corriere della Sera (in Italian). 27 January 2001. Retrieved 22 January 2016. ↑ Roberto Bianchin (20 October 1997). "BRESCIA, HUBNER E NERI CANCELLANO IL VICENZA". la Repubblica (in Italian). Retrieved 3 February 2015. 1 2 3 4 5 6 Andrew Murray (7 July 2015). "The making of Pirlo: "From an early age, I knew I was better than others"". FourFourTwo. Retrieved 20 April 2016. 1 2 "Reggina: Possanzini e Marazzina sulla scia di Pirlo, Baronio e Kallon". La Gazzetta dello Sport (in Italian). 13 October 2000. Retrieved 3 February 2015. 1 2 Vanni Spinella (13 January 2015). "Mercato story: Pirlo al Brescia, magie in coppia con Baggio" (in Italian). Sky Sport. Retrieved 22 January 2016. 1 2 "Roberto Baggio: "Pirlo è un fuoriclasse"". TUTTOmercatoWEB.com (in Italian). Retrieved 3 February 2015. ↑ "Pirlo: "Tra tutti i trofei vinti scelgo assolutamente il Mondiale!"" (in Italian). Italian Football Federation. Retrieved 3 February 2015. 1 2 Christian Giordano (13 August 2008). "Da Tardelli a Desailly, cambiare serve". la Repubblica (in Italian). Retrieved 3 February 2015. ↑ Gianni Piva (2 March 2001). "Baggio, i gol per un sogno "Il Mondiale, poi smetto"". la Repubblica (in Italian). Retrieved 22 January 2016. ↑ "Mazzone fa il capolavoro Brescia settimo in classifica". la Repubblica (in Italian). 17 June 2001. Retrieved 22 January 2016. ↑ "La vendetta di Baggio Juve, scudetto lontano". la Repubblica (in Italian). 1 April 2001. Retrieved 3 February 2015. ↑ Roberto Perrone; Guido Vaciago (2 April 2001). "Baggio taglia la strada alla Juve". Corriere della Sera (in Italian). Retrieved 22 January 2016. ↑ "L'Inter ha ceduto pirlo al Milan" (in Italian). Inter Milan. 30 June 2001. Retrieved 3 February 2010. ↑ Malagutti Vittorio (6 November 2002). "Va di moda il calciatore salvabilanci". Corriere della Sera (in Italian). Retrieved 31 March 2010. ↑ Gen Gladwell (4 May 2015). "Real Madrid boss Carlo Ancelotti 'changed my career' – Andrea Pirlo". ESPN FC. Retrieved 8 October 2017. ↑ "Pirlo al Brescia trova Baggio". Corriere della Sera (in Italian). 27 January 2001. Retrieved 3 February 2015. 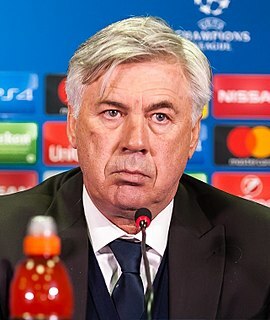 ↑ "L'albero di Natale di Ancelotti" . Retrieved 4 February 2015. 1 2 "Andrea Pirlo Topics Page". USA Today. 6 February 2008. Retrieved 15 May 2012. 1 2 Matthew Scianitti (18 May 2010). "Andrea Pirlo: The Metronome". CBC Sports. Retrieved 22 January 2016. ↑ Blair Newman (24 April 2015). "The relationship between a player's age and their position on a football pitch". The Guardian. Retrieved 15 January 2018. ↑ "BATE-Milan (0–2)". UEFA. Archived from the original on 27 June 2014. Retrieved 4 February 2015. ↑ "Pirlo e doppietta di Inzaghi il Milan scavalca il Chievo". la Repubblica. Retrieved 4 February 2015. ↑ "Al Milan anche la Coppa Italia". la Repubblica (in Italian). Retrieved 4 February 2015. ↑ "Milan vince 3–2 ai rigori" (in Italian). UEFA. Archived from the original on 16 August 2017. Retrieved 4 February 2015. ↑ "Grande Dida, coppa al Milan ma la Juve piange se stessa". la Repubblica (in Italian). Retrieved 4 February 2015. ↑ "Supercoppa, il Milan fa il bis in Europa". la Repubblica (in Italian). Retrieved 4 February 2015. ↑ "2003, Milan ko: alla Juve va la Supercoppa italiana". Corriere dello Sport (in Italian). 3 August 2003. Archived from the original on 27 July 2014. Retrieved 4 February 2015. ↑ "Intercontinental Club Cup 2003". Rec.Sport.Soccer Statistics Foundation. Retrieved 3 February 2015. ↑ "2003, Il Milan ko ai rigori addio Coppa Intercontinentale". Corriere dello Sport (in Italian). 14 December 2003. Archived from the original on 27 July 2014. Retrieved 4 February 2015. ↑ "Milan, troppi errori dal dischetto l'Intercontinentale al Boca". la Repubblica (in Italian). Retrieved 4 February 2015. ↑ "Kakà e Shevchenko d'applausi". La Gazzetta dello Sport (in Italian). Retrieved 22 January 2016. ↑ "Il Milan stravince la Supercoppa italiana". Corriere della Sera (in Italian). 21 August 2001. Retrieved 22 January 2016. ↑ "UEFA Champions League 2004/05 Statistics: Assists". UEFA. Archived from the original on 1 October 2015. Retrieved 19 June 2015. ↑ "Uefa Champions League 2004–05 Statistics". Archived from the original on 26 December 2010. Retrieved 22 July 2012. ↑ "2004/05: Il Liverpool beffa il Milan" (in Italian). UEFA. Archived from the original on 6 February 2015. Retrieved 4 February 2015. ↑ "Liverpool triumph in Turkey". UEFA. 25 May 2005. Archived from the original on 31 December 2010. Retrieved 28 June 2012. ↑ "Pirlo e il passato: "All'Inter Hodgson mi chiamava Pirla. Volevo smettere dopo Istanbul"". La Gazzetta dello Sport (in Italian). 15 April 2014. Retrieved 4 February 2015. ↑ "ANDREA PIRLO EXCLUSIVE:". Daily Mail. Retrieved 4 February 2015. ↑ "2005–06 UEFA Champions League" (in Italian). UEFA. Retrieved 3 February 2015. 1 2 "Cannavaro mister Pallone d'Oro". La Gazzetta dello Sport (in Italian). 11 November 2006. Retrieved 4 February 2015. ↑ "Un Milan stellare batte il Manchester I rossoneri volano in finale". La Gazzetta dello Sport (in Italian). Retrieved 4 February 2015. ↑ "Inzaghi su Pirlo: "Indimenticabile il suo assist involontario ad Atene"" (in Italian). Milan News. Archived from the original on 4 February 2015. Retrieved 3 February 2015. ↑ "2006–07 UEFA Champions League: AC Milan" (in Italian). UEFA. Retrieved 3 February 2015. ↑ "Champions, il Milan sul tetto dell'Europa Inzaghi cancella l'incubo di Istanbul". la Repubblica (in Italian). Retrieved 3 February 2015. ↑ "2007: Milan overcome sombre Sevilla". UEFA. Retrieved 7 July 2015. 1 2 "2009 UEFA Super Cup Match Press Kit" (PDF). UEFA. 28 August 2009. Archived from the original (PDF) on 3 March 2016. Retrieved 4 December 2015. ↑ Scott Murray (7 July 2015). "A brief guide to … Andrea Pirlo, the ultimate hipster footballer". The Guardian. Retrieved 7 July 2015. ↑ "World Player of the Year". Rec.Sport.Soccer Statistics Foundation. Archived from the original on 12 January 2016. Retrieved 4 February 2015. 1 2 "European Footballer of the Year ("Ballon d'Or") 2007". Rec.Sport.Soccer Statistics Foundation. Retrieved 4 February 2015. ↑ "THE WORLD'S BEST PLAYMAKER". International Federation of Football History & Statistics. Retrieved 4 February 2015. ↑ Mark Ogden (1 June 2009). "Chelsea manager Carlo Ancelotti: Profile". The Daily Telegraph. Retrieved 27 April 2016. 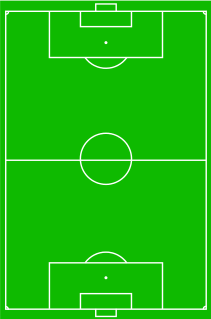 1 2 "AC Milan". UEFA. Retrieved 27 April 2016. ↑ "Coppa Italia, il Catania elimina il Milan Totti 200 volte in gol e la Roma va". la Repubblica (in Italian). 16 January 2008. Retrieved 27 April 2016. 1 2 "Ancelotti lascia, Leonardo nuovo tecnico del Milan" (in Italian). Il Sole 24 Ore. 31 May 2009. Retrieved 27 April 2016. ↑ Riccardo Pratesi (3 December 2008). "La Lazio caccia fuori il Milan". La Gazzetta dello Sport (in Italian). Retrieved 27 April 2016. ↑ "Unsettled Andrea Pirlo admits Milan squad have 'taken Kaka's exit badly'". The Guardian. 10 June 2009. Retrieved 8 May 2015. ↑ "Milan Star Pirlo Pleased Chelsea Transfer Saga Is Over". Goal.com. 5 August 2009. Retrieved 15 May 2012. ↑ Paolo Bandini (21 October 2009). "Champions League: Real Madrid v Milan – as it happened". The Guardian. London. Retrieved 28 June 2012. ↑ "Leonardo and AC Milan part company". CNN. 14 May 2010. Retrieved 27 April 2016. ↑ "Report: AC Milan v Genoa – Italian Serie A". ESPN Soccernet. 25 September 2010. Retrieved 28 June 2012. ↑ "Parma 0–1 AC Milan: Superb Andrea Pirlo strike sends Massimiliano Allegri's men top of Serie A". Goal.com. 2 October 2010. Retrieved 28 June 2012. ↑ "Report: AC Milan v Cagliari – Italian Serie A". ESPN Soccernet. 14 May 2011. Retrieved 28 June 2012. ↑ "Pirlo leaving Milan". Sky Sports. 18 May 2011. Retrieved 18 May 2011. ↑ "Andrea Pirlo". ESPN Soccernet. Retrieved 28 June 2012. ↑ "400 VOLTE ANDREA" (in Italian). A.C. Milan. Retrieved 3 February 2015. ↑ "Buffon: Pirlo was signing of the century". FIFA. Retrieved 29 September 2014. ↑ "Andrea Pirlo signs for Juventus". Juventus F.C. 24 May 2010. Archived from the original on 20 October 2012. Retrieved 24 May 2011. 1 2 3 4 5 6 Adam Digby. "Andrea Pirlo still as good as ever". Sports Illustrated. Retrieved 10 June 2016. ↑ "Pirlo outstanding on Juventus debut in Parma victory | Serie A News". tribalfootball.com. Retrieved 28 June 2012. ↑ Chelston D'souza (4 April 2012). "Juventus' Corner: Why Marchisio, Vidal And Pirlo Form Serie A's Best Midfield". The Hard Tackle. Retrieved 15 December 2015. ↑ "Report: Juventus v Catania – Italian Serie A". ESPN Soccernet. 18 February 2012. Retrieved 28 June 2012. ↑ "Juventus' Pirlo dedicates 5–0 victory against Fiorentina to Muamba". Goal.com. 18 March 2012. Retrieved 28 June 2012. ↑ "Fabrice Muamba – Real Madrid offer tributes". Daily Mail. London. 18 March 2012. Retrieved 28 June 2012. ↑ "Juventus are back, says Bonucci after clinching Serie A title". Goal.com. 6 May 2012. Retrieved 28 June 2012. 1 2 "Serie A, giocatori, Assist". Corriere dello Sport. Archived from the original on 7 July 2012. Retrieved 28 June 2012. ↑ Sandro Scarpa (4 May 2012). "Elogio di Pirlo su Sports Illustrated: tutto merito di... Baggio" [Praise from Pirlo in Sports Illustrated: all of this was thanks to... Baggio]. TUTTOJUVE.com (in Italian). Retrieved 7 May 2015. ↑ "Serie A Team of the Season: Pirlo, Ibrahimovic & Di Natale star in the 2011–12 campaign". Goal.com. 14 May 2012. Retrieved 28 June 2012. ↑ "Juventus 0–2 Napoli: Cavani and Hamsik clinch Coppa Italia and dash double dreams of Turin giants". Goal.com. 20 May 2012. 1 2 "Eén landgenoot in ESM Elftal van het Seizoen" (in Dutch). ElfVoetbal.nl. Retrieved 5 June 2012. 1 2 3 4 5 6 7 8 9 10 11 12 13 "Andrea Pirlo". UEFA. Retrieved 8 May 2015. ↑ "Juventus 4–2 Napoli (aet): Bianconeri sees off nine-man Partenopei in extra time". Yahoo Sports. 11 August 2012. ↑ "Juventus 2–0 Parma: Pirlo free-kick seals opening-day win for champions". Goal.com. 25 August 2012. ↑ "Udinese 1–4 Juventus: Giovinco double helps sink 10-man hosts". Yahoo!. Retrieved 2 September 2012. ↑ "Juventus 4–1 Roma". ESPN FC. 29 September 2012. ↑ "Ballon d'Or 2013: Nominees List". Juventus F.C. 29 October 2012. Retrieved 6 December 2012. ↑ "Shaktar Donetsk vs Juventus: 0–1". Eurosport. Retrieved 6 December 2012. ↑ "Pirlo – Pallone Azzurro" (in Italian). Italian Football Federation. Archived from the original on 13 December 2013. Retrieved 30 January 2013. ↑ "IFFHS World's Best Playmaker 2012". International Federation of Football History & Statistics. Retrieved 30 January 2013. 1 2 "FIFA Ballon d'Or 2012 – voting results" (PDF). FIFA. 7 January 2013. Retrieved 7 January 2013. ↑ "FC Bayern München – UEFA Champions League 2012/13". UEFA. Retrieved 27 April 2016. ↑ "Coppa Italia, Juve-Lazio LIVE Pogba e Llorente dal 1'". Tuttosport (in Italian). 20 May 2015. Retrieved 27 April 2016. ↑ "Juventus vs. Lazio: 4–0". Goal.com. Retrieved 29 August 2013. ↑ "Juventus delighted for Conte, Pirlo over Ballon d'Or nominations" . Retrieved 10 December 2013. ↑ "Andrea Pirlo out for over a month". ESPN FC. Retrieved 10 December 2013. ↑ "Juve-Pirlo, il matrimonio continua, Andrea dice ancora sì fino al 2016". La Gazzetta dello Sport (in Italian). 12 January 2014. Retrieved 13 January 2014. 1 2 "Oscar del calcio: Vidal e Pirlo sono il top. La Juve è la più forte d'Italia". Tuttosport (in Italian). 27 January 2014. Archived from the original on 20 June 2015. Retrieved 19 June 2015. ↑ "Fiorentina vs Juventus 2014 Europa League Second Leg 0–1 Highlights Pirlo Free kick Goal Video". soccer-blogger.com. 21 March 2013. Retrieved 19 May 2014. ↑ "UEFA Europa League squad of the season". UEFA. Retrieved 3 May 2014. ↑ "Andrea Pirlo signs new two-year deal at Juventus ahed 35". BBC Sport. 11 June 2014. Retrieved 11 June 2014. ↑ "Leonardo Bonucci's spectacular late volley gave Juventus victory in a fiery encounter with title rivals Roma". BBC Sport. Retrieved 9 October 2014. ↑ "Serie A: Juventus beat Empoli 2–0 to move three points clear" . Retrieved 6 November 2014. ↑ "Pogba caps Juventus recovery against Olympiacos". UEFA. 4 November 2014. Retrieved 5 November 2014. ↑ "Juventus 3–2 Olympiacos: Paul Pogba scores winner after Andrea Pirlo celebrates 100th Champions League appearance with trademark free-kick". Daily Mail. Retrieved 6 November 2014. ↑ "Buffon miglior portiere. Prima uscita con la D'Amico". La Gazzetta dello Sport (in Italian). 15 December 2014. Retrieved 15 December 2014. ↑ "Juventus' Andrea Pirlo out three weeks with ankle injury". ESPN FC. 26 February 2015. Retrieved 13 March 2015. ↑ Ben Gladwell (7 April 2015). "Claudio Marchisio and Andrea Pirlo returns delight Juve coach Allegri". ESPN FC. Retrieved 20 January 2016. ↑ Jacopo Gerna (14 April 2015). "Juventus-Monaco 1–0: Vidal su rigore fa godere Allegri e lo Stadium". La Gazzetta dello Sport (in Italian). Retrieved 14 April 2015. 1 2 "Pirlo raggiunge Mihajlovic a quota 28". TUTTOJUVE.com (in Italian). 26 April 2015. Retrieved 27 April 2015. ↑ Jacopo Gerna (20 May 2015). "Juve infinita, vince la 10ª Coppa Italia: Matri piega la Lazio ai supplementari" [An infinite Juve wins the 10th Coppa Italia: Matri sinks Lazio in extra-time]. La Gazzetta dello Sport (in Italian). Retrieved 21 May 2015. ↑ "Barcelona see off Juventus to claim fifth title". UEFA. 6 June 2015. Retrieved 6 June 2015. 1 2 "UEFA Champions League squad of the season". UEFA. 9 June 2015. Retrieved 9 June 2015. 1 2 3 "Thanks for everything, Maestro". Juventus F.C. 6 July 2015. Retrieved 6 July 2015. ↑ "Andrea Pirlo: New York City sign Juventus midfielder". BBC Sport. 6 July 2015. Retrieved 6 July 2015. ↑ "Andrea Pirlo to Join New York City FC as Third Designated Player". New York City FC. 6 July 2015. Retrieved 7 July 2015. ↑ Daniel Prescott (7 July 2015). "Andrea Pirlo becomes the highest paid MLS player with an $8m salary... more than Frank Lampard, Steven Gerrard and David Villa". Daily Mail. Retrieved 31 December 2015. ↑ "Pellè completes move to Shandong Luneng". Southampton F.C. 11 July 2016. Retrieved 11 July 2016. ↑ "Graziano Pelle moves to become the fifth highest-paid player in the world... so, where will the crazy Chinese spending stop?". Daily Mail. 12 July 2016. Retrieved 17 July 2016. ↑ Bryan Graham (26 July 2015). "New York City FC v Orlando City SC". The Guardian. Retrieved 26 July 2015. ↑ Tim Hill (1 August 2015). "New York City FC 2–3 Montreal Impact – as it happened". The Guardian. Retrieved 4 August 2015. ↑ "David Villa nets winner as NYCFC snap skid, surge past DC United". ESPN FC. 13 August 2013. Retrieved 14 August 2015. ↑ Michael Butler (2 October 2015). "2015 Ballon d'Or longlist: Lionel Messi named alongside David Ospina – report". The Guardian. Retrieved 26 October 2015. 1 2 3 4 5 "Andrea Pirlo". Major League Soccer. Retrieved 26 October 2015. ↑ Steve Brenner (25 October 2015). "New York City 1–3 New England: Frank Lampard, David Villa and Andrea Pirlo spark hope for the future despite play-off failure". Daily Mail. Retrieved 26 October 2015. ↑ Eoin O'Callaghan (17 October 2015). "The MLS dream-team with Lampard, Pirlo & Villa is nothing short of a New York nightmare now". The 42. Retrieved 26 October 2015. ↑ Graham Ruthven; Graham Parker (7 March 2016). "Patrick Vieira is the new NYC FC coach but Andrea Pirlo still has problems". The Guardian. Retrieved 1 June 2016. ↑ "New York City FC midfielder Andrea Pirlo becomes first MLS player named to FIFA FIFPro World XI shortlist". Major League Soccer. 27 November 2015. Retrieved 1 June 2016. ↑ "Villa strikes twice as NYCFC downs 'Caps". TSN. 30 April 2016. Retrieved 2 May 2016. ↑ "Frank Lampard, David Villa and Andrea Pirlo score in NYCFC's win over Union". ESPN FC. 18 June 2016. Retrieved 18 June 2016. 1 2 "Villa, Pirlo and Kaka headline MLS All-Star squad to face Arsenal". FourFourTwo. 17 July 2016. Retrieved 18 July 2016. ↑ Mark Booth (24 October 2016). "Playoffs: All You Need to Know". New York City FC. Retrieved 1 November 2016. ↑ David Shoalts (30 October 2016). "Toronto FC tops New York City FC 2–0 after first leg of semi-final". The Globe and Mail. Retrieved 1 November 2016. ↑ Graham Parker (6 November 2016). "Toronto exploits New York City FC's tactics in 5–0 rout at Yankee Stadium". ESPN FC. Retrieved 7 November 2016. ↑ "New York City's Andrea Pirlo to retire at end of MLS season". ESPN FC. 8 October 2017. Retrieved 8 October 2017. ↑ "Timbers fall as Toronto, Columbus edge through". beIN Sports. 5 November 2017. Retrieved 6 November 2017. ↑ "Pirlo to hang up his boots". Football Italia. Tiro Media. 6 November 2017. ↑ "Official: Pirlo confirms retirement". Football Italia. Tiro Media. 6 November 2017. ↑ "Inzaghi hat-trick in Pirlo testimonial". Football Italia. Tiro Media. 21 May 2018. Retrieved 22 May 2018. ↑ "FIFA World Cup: Gianluigi Buffon, Andrea Pirlo Still Hungry for Italian Job". NDTV Sports. 8 June 2014. Retrieved 9 June 2014. ↑ "The Pirlo Dilemma". Postmatch. 27 June 2013. Archived from the original on 30 June 2013. Retrieved 9 June 2014. ↑ Andrea Pirlo a giant of his generation , ESPN, 25 October 2011. ↑ "Olympic Football Tournaments, Sydney 2000 – Men: Australia – Italy (0–1)". FIFA. 13 September 2000. Retrieved 27 May 2015. ↑ "Italia, Del Piero e pochi lampi ma comincia con una vittoria". la Repubblica (in Italian). Retrieved 11 October 2014. ↑ Mirko Graziano (10 September 2012). "Pirlo come Del Piero 91 volte con l'Italia". La Gazzetta dello Sport (in Italian). Retrieved 25 July 2017. ↑ "La nuova Italia bella a metà Vieri evita la sconfitta". la Repubblica (in Italian). 20 November 2002. Retrieved 25 July 2017. ↑ "I debuttanti del gol fanno bella l'Italia". la Repubblica (in Italian). Retrieved 11 October 2014. ↑ "2006 FIFA World Cup Germany™". FIFA. Retrieved 28 June 2012. ↑ "Silent but deadly: Italian midfield maestro's skills do talking for him". The Irish Times. Retrieved 31 August 2012. ↑ "Italy 2—0 Scotland". BBC Sport. 26 March 2005. Retrieved 3 November 2017. ↑ "Lippi ha fiducia, nonostante tutto Convocato Buffon: "E' sereno"". la Repubblica (in Italian). 15 May 2006. Retrieved 20 January 2017. 1 2 Antonio Sansonetti (6 June 2014). "Home Sport Italia 2006: campioni del mondo. Grosso jolly, Cannavaro e Buffon muro: voto simpatia 7,5". Blitz Quotidiano (in Italian). Retrieved 3 July 2016. ↑ "Italy 2–0 Ghana". BBC Sport. 12 June 2006. Retrieved 28 June 2012. ↑ "Italy 1–1 USA". BBC Sport. 17 June 2006. Retrieved 28 June 2012. ↑ "Last-gasp Italy knock Germany out". BBC Sport. 4 July 2006. Retrieved 28 June 2012. ↑ Stevenson, Jonathan (9 July 2006). "Zidane off as Italy win World Cup". BBC Sport. Retrieved 28 June 2012. ↑ "2006 FIFA World Cup Germany". FIFA. Retrieved 28 June 2012. ↑ "Speciale Mondiali 2006: Italia (Gruppo E)" (in Italian). Tiscali. Archived from the original on 26 June 2008. Retrieved 13 January 2015. ↑ Ty Duffy (25 February 2012). "AC Milan Meets Juventus in Potential Scudetto Decider". The Big Lead. Gannett. Retrieved 28 June 2012. ↑ "'I don't feel pressure – I don't give a toss about it' – The best quotes by and about Andrea Pirlo". Goal.com. 6 July 2015. Retrieved 4 August 2016. ↑ "Full-time report Italy-Romania" (PDF). UEFA. 13 June 2008. Retrieved 22 November 2016. ↑ McNulty, Phil (17 June 2008). "France 0–2 Italy". BBC Sport. Retrieved 28 June 2012. ↑ "Spain 0–0 Italy". ESPN Soccernet. 22 June 2008. Retrieved 15 June 2010. ↑ "Casillas' saves put Spain in semis". UEFA. 22 June 2008. Archived from the original on 25 May 2010. Retrieved 28 June 2012. ↑ Richard Aikman (19 June 2008). "Can Azzurri cope without suspended duo?". UEFA. Retrieved 19 May 2016. ↑ "2009 FIFA Confederations Cup: Italy vs. USA: 3–1". United States Soccer Federation. Archived from the original on 12 May 2013. Retrieved 18 June 2013. ↑ "Irresistible Brazil eliminate Italy". FIFA. 21 June 2009. Retrieved 4 May 2015. ↑ Paul Wilson at Soccer City (24 June 2010). "Slovakia 3–2 Italy". The Guardian. London. Retrieved 28 June 2012. ↑ "UEFA EURO – Italy –". UEFA. 20 June 2012. Retrieved 28 June 2012. ↑ Italy (7 September 2010). "Italy 5 Faroe Islands 0: match report". The Daily Telegraph. London. Retrieved 28 June 2012. ↑ "Euro 2012: Italy team profile". BBC Sport. 9 May 2012. Retrieved 28 June 2012. ↑ "Di Natale recalled for provisional Italy squad –". UEFA. 13 May 2012. Retrieved 28 June 2012. ↑ Smith, Ben (10 June 2012). "Euro 2012: Spain 1–1 Italy". BBC Sport. Retrieved 28 June 2012. ↑ "Euro 2012: Day seven as it happened". BBC Sport. 14 June 2012. Retrieved 28 June 2012. ↑ "Italy vs. Croatia (1–1)" (PDF). UEFA. 14 June 2012. Retrieved 27 May 2015. ↑ "Match Report: Italy 2–0 Republic of Ireland". Goal.com. 19 June 2012. Retrieved 28 June 2012. ↑ Republic of Ireland (18 June 2012). "Italy 2 Republic of Ireland 0: match report". The Daily Telegraph. London. Retrieved 28 June 2012. ↑ "Euro 2012: Italy deserved winner over England". ESPN FC. 24 June 2012. Archived from the original on 28 June 2012. Retrieved 28 June 2012. 1 2 "Euro 2012 analysis: Peerless Pirlo exposes England". BBC Sport. 24 June 2012. Retrieved 28 June 2012. ↑ "calcio without citizenship: Azzurri: Eloquent, Decisive, and Devastating". not even an oriundo. Archived from the original on 13 April 2014. Retrieved 28 June 2012. ↑ "Pirlo: 'Why I chipped Hart'". Football Italia. Tiro Media. 24 June 2012. Retrieved 28 June 2012. ↑ Phil McNulty (24 June 2012). "England 0–0 Italy (2–4 on penalties)". BBC Sport. Retrieved 7 May 2015. ↑ Lawton, Matt (28 June 2012). "Germany 1 Italy 2: Magic Mario makes his mark as Azzurri extend tournament hoodoo". Daily Mail. London. ↑ Moretti, Alvaro (1 July 2012). "L'Italia crolla in finale. Spagna campione d'Europa" [Italy collapses in the final. Spain champions of Europe]. Tuttosport (in Italian). Archived from the original on 30 March 2015. Retrieved 15 March 2015. ↑ "UEFA EURO 2012 Team of the Tournament". UEFA. 2 July 2012. ↑ "Italy name Confederations Cup squad: Ogbonna and Ranocchia miss out". La Gazzetta dello Sport. 4 June 2013. Archived from the original on 11 June 2013. Retrieved 8 June 2013. ↑ "Italy 2 Mexico 1: Pirlo lights up 100th cap with stunning free-kick as Balotelli strikes to grab win in Confederations Cup clash". Daily Mail. London. 16 June 2013. Retrieved 16 June 2013. ↑ "FIFA Confederations Cup 2013 – Italy vs Japan: 4–3". La Gazzetta dello Sport. 20 June 2013. Archived from the original on 24 June 2013. Retrieved 24 June 2013. ↑ "Injured Pirlo Not to Play Against Brazil". The Hindu. Chennai, India. 21 June 2013. Retrieved 24 June 2013. ↑ "Spain edge dramatic shootout to reach Final". FIFA. 27 June 2013. Archived from the original on 18 April 2015. Retrieved 27 May 2015. 1 2 "2013 FIFA Confederations Cup Dream Team". FIFA. Retrieved 27 May 2015. ↑ "Adidas Golden Ball Shortlist". FIFA. Retrieved 1 July 2013. 1 2 "Zico: Italy pay price for over-reliance on Andrea Pirlo and must rebuild". The Guardian. 25 June 2014. Retrieved 26 June 2014. ↑ "Resolute Italy head off Armenia challenge". UEFA. 12 October 2012. Retrieved 12 June 2014. ↑ "Italy squad for 2014 World Cup: the 23 chosen by Cesare Prandelli". The Guardian. 5 June 2014. Retrieved 12 June 2014. ↑ "Pirlo to quit Italy after World Cup". ESPN FC. 12 June 2014. Retrieved 12 June 2014. ↑ "England's World Cup rivals Italy livid they are in Group of Death that also includes Uruguay". Daily Mirror. Retrieved 26 June 2014. ↑ "Italy prove they are the pass masters as Azzurri rack up highest accuracy ever recorded in a World Cup game since 1966". Daily Mail. Retrieved 16 June 2014. ↑ "Inghilterra-Italia 1–2: gol di Marchisio, Sturridge e Balotelli". La Gazzetta dello Sport (in Italian). 15 June 2014. Retrieved 16 May 2014. ↑ "Pirlo: Se il nuovo ct vuole resto in azzurro". La Stampa (in Italian). 26 June 2014. Retrieved 26 June 2014. ↑ "Andrea Pirlo Returns to Italy Squad Following Giacomo Bonaventura's Injury". Bleacher Report. Turner. 6 October 2014. Retrieved 30 November 2014. ↑ "Qualificazioni Euro 2016 – Pirlo supera Zoff: 113 presenze in Nazionale" (in Italian). Eurosport. 10 October 2014. Archived from the original on 19 November 2015. Retrieved 1 June 2016. ↑ "Pirlo shows he is too good to retire as Chiellini rescues Italy". Goal.com. 10 October 2014. Retrieved 11 October 2014. ↑ "Verratti and Pirlo against Malta?". Football Italia. Tiro Media. 2 September 2015. Retrieved 3 September 2015. ↑ "Italy keep pace in Euro Qualifying after lackluster win over Malta". Fox Sports. 3 September 2015. Retrieved 3 September 2015. 1 2 3 "Nazionale in Cifre – FIGC: Pirlo, Andrea" (in Italian). Italian Football Federation. Retrieved 17 April 2015. ↑ "Italy beats Azerbaijan to qualify for Euro 2016". Sportsnet. 10 October 2015. Retrieved 4 January 2016. ↑ Ben Gladwell (24 May 2016). "MLS play cost Andrea Pirlo, Sebastian Giovinco their Italy chance – Conte". ESPN FC. Retrieved 27 May 2016. ↑ Allan Valente (30 May 2016). "Andrea Pirlo accepts Antonio Conte's Italy snub for Euro 2016". Sky Sports. Retrieved 1 June 2016. ↑ Roberto Di Maggio; José Luis Pierrend (14 September 2017). "Appearances for Italy National Team". Rec.Sport.Soccer Statistics Foundation. Retrieved 7 November 2017. 1 2 "Buffon reveals 'greatest Italians'". fantasista10. Retrieved 29 September 2014. ↑ Carlo Ancelotti (4 June 2016). "Andrea Pirlo spots a pass in a split second that others wait a lifetime to see". The Daily Telegraph. Retrieved 6 June 2016. ↑ Kris Voakes; Ben Hayward (2 June 2015). "Pirlo, Xavi make their claim of being the best midfielder in the modern era". Fox Sports. Retrieved 9 June 2016. ↑ Mark Booth (6 November 2017). "Vieira: Pirlo Changed Football Forever". New York City FC. Retrieved 22 May 2018. ↑ "Mazzone manda in campo un Brescia spavaldo: due punte e Pirlo rifinitore E Baggio vuole farsi rimpiangere". Il Tirreno (in Italian). 24 February 2001. Retrieved 29 September 2014. ↑ "Boninsegna: "Pirlo è il nuovo Rivera"". Tutto Nazionali (in Italian). Retrieved 29 September 2014. ↑ "Adelio Moro: "Pirlo, come lui solo Rivera. Mazzone lo ha plasmato..."". TUTTOmercatoWEB.com (in Italian). Retrieved 29 September 2014. ↑ "Mazzone: "Il ruolo di Pirlo? Una mia intuizione"". TUTTOmercatoWEB.com (in Italian). Retrieved 29 September 2014. ↑ "The Resurgence of the Deep Lying Playmaker-Part 1". The False 9. Retrieved 29 September 2014. ↑ Michael Cox (19 March 2012). "Paul Scholes, Xavi and Andrea Pirlo revive the deep-lying playmaker". The Guardian. Retrieved 29 September 2014. ↑ "Allegri e Pirlo, storia di un rapporto impossibile". Panorama (in Italian). Retrieved 29 September 2014. ↑ "Euro 2012: Why Andrea Pirlo Is the Most Valuable Player of the Tournament". Bleacher Report. Turner. Retrieved 29 September 2014. ↑ Armen Bedakian (26 July 2015). "VIDEO: Andrea Pirlo makes New York City FC debut against Orlando City". theScore Inc. Retrieved 30 January 2017. ↑ "The Champions: Andrea Pirlo". Juventus F.C. 13 June 2013. Retrieved 30 January 2017. ↑ Matthew Scianitti (1 July 2012). "Euro 2012 wrap: Spain comes together to make history". National Post. Retrieved 30 January 2017. 1 2 Jim White (4 March 2014). "Italy's Andrea Pirlo is old, slow, rarely sprints and is just not the player he was – because he is even better". The Daily Telegraph. Retrieved 30 January 2017. 1 2 "Andrea Pirlo". BBC Sport. 25 May 2004. Retrieved 30 January 2017. 1 2 Michael Cox (12 May 2015). "Champions League semis showcase changing role of deep-lying midfielder". ESPN FC. Retrieved 30 January 2017. 1 2 Mike Henson (7 November 2017). "Andrea Pirlo: The football genius who defied the number crunchers". BBC Sport. Retrieved 7 November 2017. ↑ "Pirlo: Allegri didn't want me". Football Italia. Tiro Media. 11 May 2012. Retrieved 15 April 2016. 1 2 3 4 "Andrea Pirlo". la Repubblica (in Italian). 23 May 2008. Retrieved 29 September 2014. ↑ Zito Madu (23 June 2015). "In remembrance of the fully featured version of Andrea Pirlo". SB Nation. Vox Media. Retrieved 13 June 2016. 1 2 Mario Sconcerti (6 July 2015). "L'addio (contemporaneo) al grande calcio di Pirlo e Xavi. E il loro posto nella grande storia del calcio". Corriere della Sera (in Italian). Retrieved 30 January 2017. 1 2 Trevor Marshallsea (8 February 2016). "Six superstars shaking up the world game with the magic in their boots". Fox Sports. Retrieved 30 January 2017. ↑ Angelo Carotenuto (2 March 2017). "Se ti viene la pelle d'oca hai scovato un campione". la Repubblica (in Italian). Retrieved 13 September 2018. 1 2 3 4 5 6 Dampf, Andrew (29 May 2008). "Totti is gone, Pirlo becomes the pacesetter for Italy". USA Today. Retrieved 15 May 2012. ↑ "Andrea Pirlo". ESPN Soccernet. Retrieved 25 July 2012. 1 2 Jason De Vos (28 June 2012). "DE VOS: THOUGHTS ON BALOTELLI, PIRLO, PRANDELLI AND MORE". The Sports Network. Retrieved 30 January 2017. ↑ Owen Gibson (15 June 2014). "Andrea Pirlo the pass master stars in his own film to hurt England". The Guardian. Retrieved 30 January 2017. 1 2 Miguel Delaney (23 June 2012). "The Pirlo King". The Independent. Retrieved 30 January 2017. 1 2 Sam Cooper (26 May 2015). "The Role of Xavi and Pirlo". Sport.net. Retrieved 30 January 2017. 1 2 3 Giuseppe Muro (27 June 2012). "Joachim Low: It's idiotic to man-mark Pirlo". London Evening Standard. Retrieved 30 January 2017. ↑ "Tanti esperimenti e studio alla tv Ecco il segreto delle magie di Pirlo". La Stampa (in Italian). 12 November 2013. Retrieved 31 January 2017. ↑ "Key battles". Sky Sports. 30 June 2012. Retrieved 30 January 2017. ↑ Max Towle (9 May 2013). "25 Most Skilled Passers in World Football History". Bleacher Report. Turner. Retrieved 10 October 2018. ↑ Antonio Guerra (17 March 2015). "Tuttosport – La Juve e il tiro dalla distanza. Nei campionati europei i bianconeri segnano più di tutti da lontano". TUTTOJUVE.com (in Italian). Archived from the original on 5 July 2015. Retrieved 5 July 2015. 1 2 3 "Pirlo e le punizioni da Diavolo: "Ho imparato studiando Baggio"". il Giornale (in Italian). Retrieved 29 September 2014. ↑ "Calcio, Milan: Pirlo entra per battere rigore e segna". la Repubblica (in Italian). Retrieved 29 September 2014. ↑ "De Rossi: "Pirlo come Totti" "Il rigore? L'ho visto carico"". la Repubblica (in Italian). 24 June 2012. Retrieved 29 September 2014. ↑ "Kings of the free-kick". FIFA. 2 December 2011. Retrieved 13 March 2015. ↑ Roger Bennett (27 June 2012). "Ageless Pirlo continues to produce". ESPN FC. Retrieved 30 January 2017. ↑ "Alessio: Pirlo is world's best free-kick taker". FourFourTwo. 20 March 2014. Retrieved 5 July 2015. ↑ "Free-kick master Pirlo". Football Italia. Tiro Media. 19 March 2014. Retrieved 19 July 2015. ↑ Currò, Enrico (29 March 2005). "Pirlo l'uomo nuovo "Ho imparato guardando Baggio"". la Repubblica (in Italian). Retrieved 16 May 2012. ↑ "Juventus: Pirlo, ma che punizione hai tirato? La maledetta che sfida la fisica". La Gazzetta dello Sport (in Italian). 11 November 2013. Retrieved 29 September 2014. ↑ "Belle e "maledette": vi spiego io le parabole di Pirlo" (in Italian). Sky Sport. 21 January 2012. Retrieved 29 September 2014. ↑ "Pirlo surpasses Del Piero in Serie A Free Kick Ranking". Goal.com. 31 October 2013. Retrieved 1 November 2014.